Billy Gene Holder passed away on January 25, 2019, at his home in Loachapoka, Alabama at the age of 85, surrounded by his family. Born to Judson Eugene and Era Lowe Holder on October 14, 1933, in Georgiana, Bill grew up in Butler County, Alabama. He served his country in the U.S. Army during the late 1950’s. 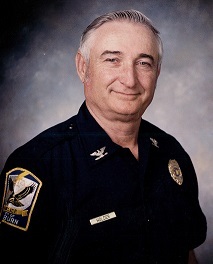 Eventually, he found his way to Auburn, Alabama, where he joined the Auburn Police Department in 1960. After attending the Police Academy, he served his community as a dedicated police officer for about 27 years. He worked his way up through the ranks, the last five years in which he proudly served as Chief of Police for the City of Auburn. He has lived in Loachapoka for 50 years, where he has enjoyed farming and raising cattle. He truly loved to be outdoors and was an expert hunter and fisherman. Bill had an impact on everyone he met and he had no enemies. He was preceded in death by his first wife of 28 years, Patricia Ann Holladay Holder. He is survived by his wife of 27 years, Carolyn Pound Holder; his three children: Jerry (Carol) Holder, Jenny (David) Albright, and Ricky Holder; his nine grandchildren: Rachel Holder, Mimi (Gavin) Ross, Caroline Holder, Rusty (Katie) Albright, Jessica (Tim) Dumas, Ben (Lori) Albright, Jacob Albright, Erin Holder, and Lynn Holder; his six great-grandchildren: Lily, Jenna, and Micah Dumas, Ezra and Easton Albright, and Ruby Ross; along with several siblings, many nephews and nieces, as well as other family and friends that knew and loved him. The funeral service for Billy Holder will be 2:00pm Monday, January 28, 2019 at Jeffcoat-Trant Funeral Home. Visitation will be two hours before the service beginning 12:00 noon until 2:00pm at Jeffcoat-Trant Funeral Home. Reverend Thad Blount and Chief Barney Harding will be officiating, burial will follow the service at Auburn Memorial Park Cemetery. Pallbearers will include: Michael Gavin Ross, Luke Eden, Jerry Shiparski, Rusty Albright, Ben Albright, Jacob Albright, and Tim Dumas. In lieu of flowers, the family requests that donations be made to the local Hospice care: Compassus, 665 Opelika Rd., Suite 200, Auburn, AL. 36830, or to a local church or charity of your choice.